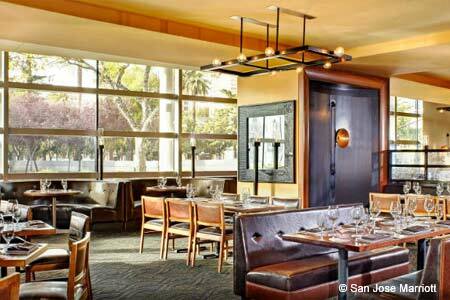 : With this chic, elegantly appointed, 130-seat restaurant at the San Jose Marriott, Michael Mina has created one of the more sophisticated dining spots in the South Bay. The dinner menu includes longstanding Mina classics such as Maine lobster potpie with truffle cream and seasonal vegetables, presented tableside by very professional waitstaff. Another mainstay, whole chicken for two, is fried in duck fat; frying the bird whole crisps the skin and keeps the meat greaseless. A high-end steak menu ranges from filet mignon to American Wagyu flatiron and dry-aged New York strip, as well as bone-in specialties such as a 20-ounce cowboy rib-eye, Kurobuta pork chops and rack of lamb. You can also add bone marrow, a butter-poached lobster tail, or select from more than half a dozen sides. There are four sauces from which to choose, including Pinot Noir bordelaise and chimichurri. If you’re not in a meat mood, opt for fresh fish. The wine list focuses primarily on boutique wines from America. Arcadia also serves daily breakfast, and is a go-to lunch spot for the business set.